What do you plan on doing with your precious metals in 5, 10…even 30 years? If you’re like most people, you’ll eventually sell at least some quantity for profit, as retirement funding, or in case of emergency. Whatever the reason, if your precious metals dealer won’t buy back your metals from you, it could be bad news for your investment portfolio. Fortunately, if you do your homework and choose a reputable dealer, you don’t have to worry. 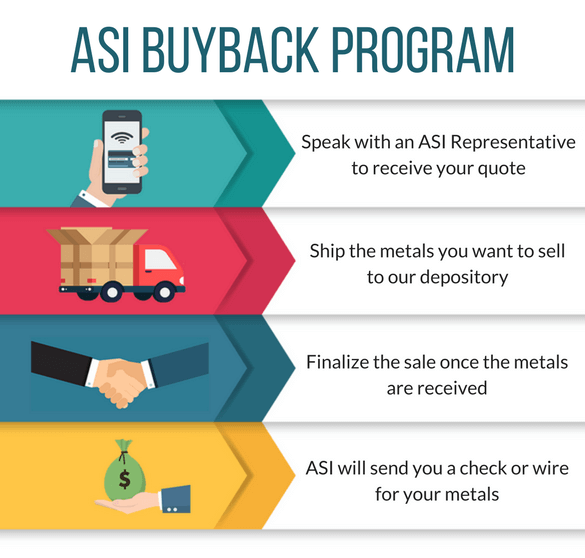 At ASI, we only offer products we expect will always have a two-way market. All of our products come with an explicit exit plan up-front, and even if you bought your assets somewhere else, we’ll buy them back...as long as there is a market for them. At ASI, the answer to this question—as long as there is a market—is always: Yes! It’s the first question I always ask, and it should be the first one you ask, as well. We have one word of advice if a dealer tells you they won’t buy back your assets: Run. And fast. Typically, if a dealer is unwilling to buy something back, it’s because they’re overcharging you for the product, and they don’t want to support that price in the secondary market. How Do I Sell My Metals? Selling back your precious metals is as easy as simply giving us a call! It’s important to remember, however, that we can only help you if we know your goals and concerns. Communication is critical. Instructions to deliver the merchandise to us. Options for paying you once you agree to the price. Tell you what we would pay for it if you sold it to us right now. Make some suggestions as to what is worth holding or selling. And, if there is merchandise with limited to no upside, we will suggest what you might consider replacing that merchandise with to potentially achieve better results. Bottom line, we put value on everything we sell. If we didn’t, I’d have trouble sleeping at night…charging you for something I don’t value at all. The best advice any investor can follow is to make sure, up front, that a viable exit plan exists for any asset you purchase. If your dealer can’t say yes to the question, “When I am ready to sell, will you buy it back?” …beware. With that said, if you ever have a need to sell your precious metals or other assets, please call us at 800-831-0007 or email us. Regardless of where you purchased them, we’ll buy them back at highly competitive rates, given there is a market for your merchandise. We’ll even give you an appraisal if you’re not looking to sell quite yet. It really is that simple to Sell What’s Yours!